Hayley Harmer, style advisor for A Suit That Fits, gives her top tips on finding attire for grooms. When starting on the search for the perfect suit, how do I know which style to choose? Sometimes the location/theme of your wedding will automatically dictate whether you should wear tails or a suit. However, think of your purchase as an investment. Wearing a two- or three-piece design has the advantage of being able to be worn again. 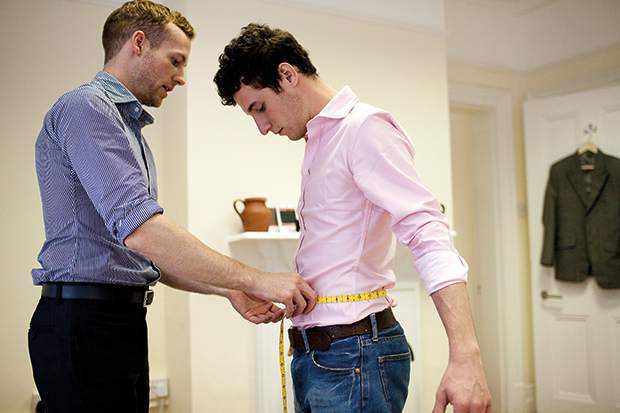 Having never had a bespoke suit fitted before, how do I know which cut feels right for me? Go for a fit you're comfortable with and which suits your body shape. Sartorial etiquette states that you should be able to see a bit of your shirt cuff past the jacket sleeve. Trouser length should have one break in the leg and when wearing a waistcoat, always leave the bottom button undone. For inspiration, research designs and styles to give you an insight as to how you see your wedding party looking. If I wanted a bespoke suit, what's the design process and time needed for creating my suit before the big day? Going bespoke is a great way to ensure you have the perfect fit. In a consultation, you would discuss with your tailor the appearance you want to achieve. The general process during your consultation is to go through cloth, lining and style; once that's done, it's then on to the measurements and it's as easy as that! With your design you can add personalised labels, hand stitching, printed linings, horn buttons – there are endless design attributes. If you're wearing your suit regularly after the wedding, bear in mind the durability of the cloth. You'd need to allow six to eight weeks for a standard turnaround time and allow a few weeks after that for any fittings you may need. Let's be honest, having a suit you designed is pretty amazing! What's the best way to accessorise my chosen suit? When accessorising, less is more. Go dapper with a pocket square in a colour to match the bridesmaids' dresses, and why not differentiate yourself as the groom by having a different hue to the rest of the groomsmen? There are several ways in which to fold a pocket square, but if you're having a boutonniere, then fold it neatly to just peep over the edge of the breast pocket. Cravats, bow ties, ties – again, so many options, but it will depend on the theme of the wedding. Cravats and morning suits tend to work best together, bow ties are great with a smart tweed waistcoat for the country/vintage vibe and a tie will complement sleek contemporary soirees. Finally, shoe colour is very dependent on the tone of your suit; it's always good to get a swatch of the cloth to take with you when shoe shopping.